Applications (apps) have already begun to change the way the world works, thinks and communicates. Today, there’s an app for just about anything you can think of. And the future of technology sees desktop computing being slowly uprooted by apps that provide users with the capability to access everything they need right from their smart phones or tablets. But how are older Americans fitting into a market that is constantly evolving, and one that is catering to users who are presumably more technologically savvy? Freedom Home Care sees more apps being created in stripped down, simplified format to accommodate the needs of seniors and the people that care for them. Developers are starting to realize that there are a growing number of people that can and do greatly benefit from these apps. This is a positive step as caring for older loved ones often times requires lots of communication between families, seniors, doctors and caregivers. Things like staying in touch, handling expenses and coordinating care can be challenging when everyone is miles apart. Many caregiving applications can do things like manage important information, offer appointment reminders and post updates from family and friends. Others are programmed to perform basic tasks like speech-to-text and face-to-face chat. Some providers offer apps that assist in managing care for diseases like Alzheimer’s, cancer, heart disease and diabetes, creating one hub for family and caregivers to facilitate medical procedures and rehabilitation. Here a few of our favorites. CaringBridge was created to help make the health care journey easier. Not only does it offer ways for healthcare providers and others to share information, it also helps plan times for dropping off meals and scheduling visits with loved ones. CaringBridge offers a simple way for families to keep in touch, while offering encouragement and support to one another. Caregiver’s Touch links your phone to your computer to enhance the user’s experience. It retains information downloaded onto the phone, enables seniors to fill out information about their prescriptions and sends alerts when medication should be taken. Pocket First-Aid and CPR is a free app that was designed by the American Heart Association to guide families through crucial moments like what to do in the event of a heart attack, choking hazard or first aid situation. 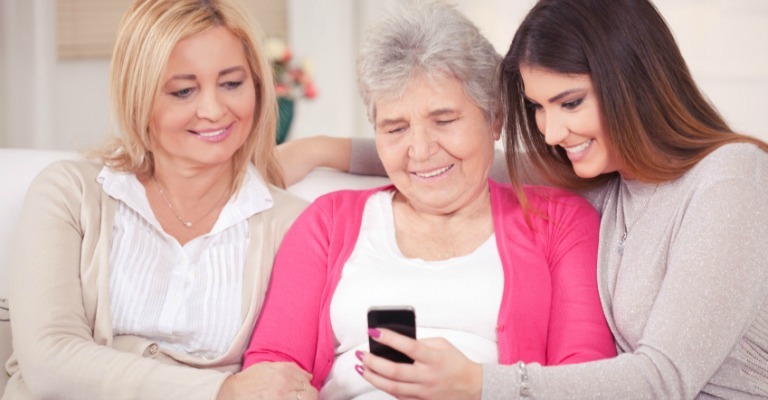 Family Ribbon helps make using social media websites easier for older loved ones to navigate. The app features simple user interfaces that help seniors keep up on Facebook, make Skype calls and send emails easily. If your senior is not comfortable using or operating apps, we understand. Which is why we are ready to provide outstanding home care services to keep your family at ease.